Fashion and beauty… These words mesmerize lots of women of different age. It is considered that a woman is getting more delicate and blooming with age. Though, some women think elsewise. Someone is afraid to put on weight and someone is looking for new wrinkles in the mirror. But all of the above don’t mean that women over fifty shouldn’t pay attention to fashion trends. Age can’t make women abandon their wish to look stylish and trendy that is why hairstyles for those who are over 50 please with their pretty models for any length and texture. If you have been following the same image for many years, you are going to look boring and plain. Trendy haircuts allow you to look a couple of decades younger and ultra-fashionable or classic. 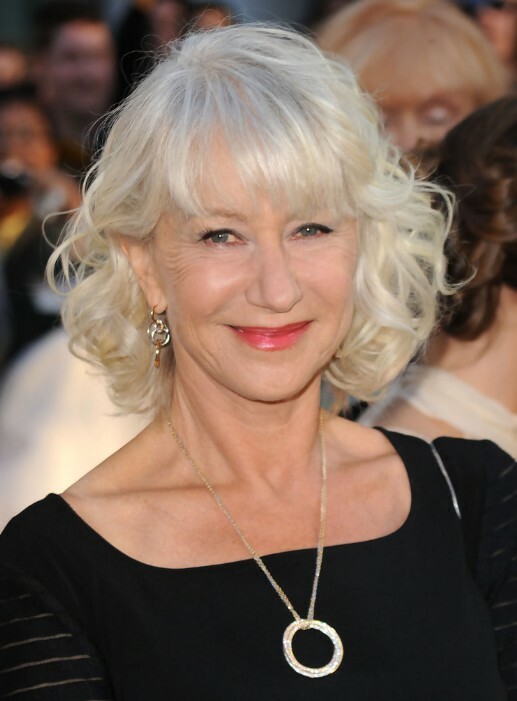 Hairstyles over 50 can differ but choosing one you have to think of your face type and skin color if you want to look perfect. make you look elegant, eye-catching and bright. a well-defined pattern of eyebrows. If you are active and optimistic, and you are used to be stylish and trendy always and everywhere, then a short haircut is for you. But do not forget that such a hairstyle goes together with fashionable clothes, perfect manicure and ideal hairdressing. Choose shoulder-length haircuts because they are very comfortable (you can put your hair in a pony-tail or let it fall) and you will look interesting and pretty with it. Remember about multi-layered haircuts that are easy to fix with a hairdryer and they frame the face, successfully hiding its minor flaws. If your hair frames your face with layers, it looks elegant. And it is possible to change your hair into one layer as if hiding the layers inside. As a result, you get volume and the hairstyle which is easy to look after. Remember that bright colors make you look young, dark ones make you look older, and hair color should be chosen according to the skin tone and eye color (the owners of “warm” eyes can be refreshed with a warm shade of blonde, red color especially wins with blue, gray or green eyes). If you got used to naturalness, then choose chestnut brown, fair or honey blond colors. Let you hairdresser add several bright strokes to your new image. If you dye your hair dark, then act boldly and confidently enough to fit into the image of a “burning brunette” in order not to gain extra five years. This hairstyle will allow you to change your image and enjoy the simple way of looking after it. This hairstyle was inspired by Maid of Orleans. Coco Chanel liked the style so much that changed her image immediately and since that time the triumph of Bob has begun. For many women bob is a combination of womanhood, youth, delicacy and character. It may be very different in length, but with the only feature – closed back of the head. Other variants are produced using the method of calibration, when hair is bent inwards or outwards (the so-called “false bob”). It looks particularly impressive if the front locks are trimmed. It reminds of rock’n’roll style – it is very casual, messy and looks “bedhead”. The typical features include choppy ends, lots of layers around the crown. It is for almost every hair texture and every hair length. It is a real treasure for those who are over 50, because at this age hair is getting thinner. Graded haircut can give volume to short or long hair, so it is ideal for adult women. This haircut can be done with any hair length, straight or curly. If your hair is short, don’t let your cut start above the jawline to frame your face beautifully. It looks best on shoulder-length hair. Thinning out is recommended to give more air to your image. If a 50-year-old woman decides to have long hair, this variant is the perfect choice for her. At the top the hair is cut a little shorter, and long ends are thinned out. You will look softer and more feminine if you fix the ends outside. Usually “Pixie” is a youth hairstyle but it suits elder women as well. “Pixie” will open your face and save your time for hairdressing. It is OK for you if you have an oval face. If you want to look free and independent, make your hair messy. If you want to look elegant, smooth down your hair and style one side forward.